BenRiach and GlenDronach distilleries, both located in Speyside, have announced the release of their oldest whiskies yet. 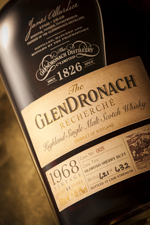 BenRiach will release Vestige, a 46-year-old single malt Scotch whisky, while GlenDronach will release Recherché, a 44-year-old Highland single malt. Vestige was distilled and transferred to cask on September 21, 1966. The whisky is said to be “classic Speyside” in style and just 62 bottles will be available worldwide, with an rrp of £3,999.99. Recherché was distilled and transferred to cask on September 24, 1968. Described as a “sublime, full-bodied, richly sherried single malt”, this whisky sees a limited release of 632 bottles worldwide, with a UK rrp of £2,749.99.